Those that know me, know that I love to craft up treats for my team at work, on holidays!!! 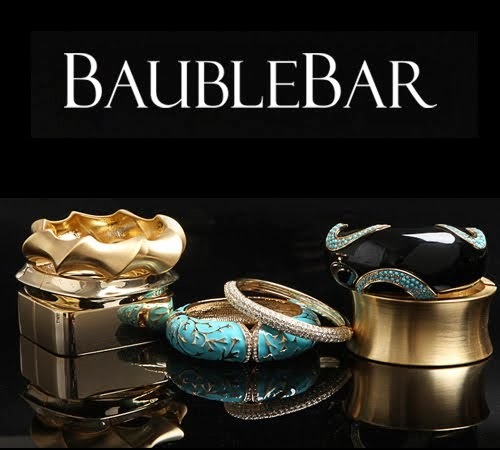 I am always looking for something fun! My good friend Amy Z, recently tweeted me the link to the Glorioustreats blog which featured the amazing cake below on the right. I created the version on the left. Yes I am aware that mine is not as crisp & clean, but hey, it was my first try!!! Below I will walk you thru the process, as well, as share my tips for things I would try next time..
First, I goggled to see tips on making the cake, I must share that I found a great new site 17 and baking. She created the cake below. 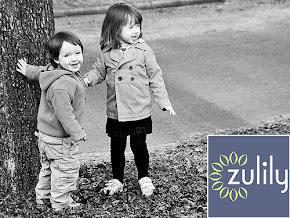 It is a neat blog, she is now in college, working at a bakery, and shares stories along with her recipes, and photos. 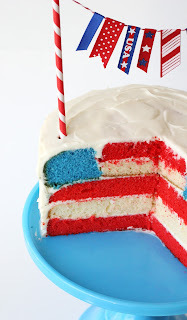 How to great a Flag cake of your own!!! 1. You will need to prepare a total of two Vanilla cake mixes (I cheated and baked boxed cakes, but you could use your favorite recipe). Prepare two 8" cake pans. Prepare one batch of batter and color it red Divide the batter equally and pour into the two prepared pans. Bake as instructed by your recipe. While the red cakes are baking, prepare another cake. Divide the batter into two bowls and color one of them blue. Leave the remaining bowl uncolored. However you get there, what you want to end up with 4 cakes. Using a serrated knife or cake leveler cut both the white and the red cakes horizontally so that you now have two layers of each. 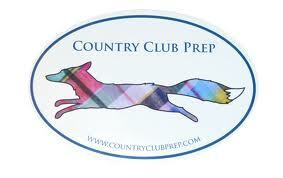 Set aside one layer of both the red and the white - these will be the two bottom stripes of your flag. You will cut a 4" circle out of these in step 3. 2. 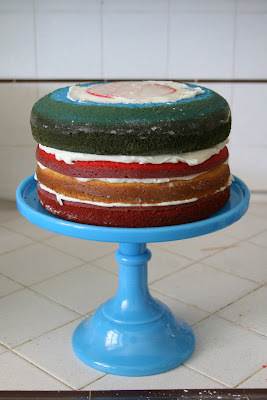 Stack the remaining red and white layers and place the blue cake on top. 3. Place a bowl or any circular guide (approximately 3 or 4 inches in diameter depending on how big you want your blue square "stars" to be in each slice) in the center of the stacked cakes. Cut around your guide through all three cakes. 5. 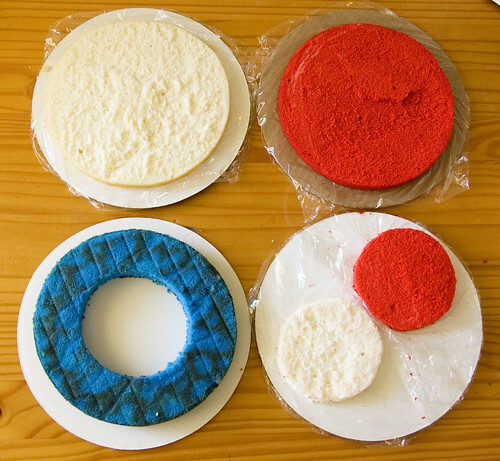 Assemble cake with a thin layer of frosting between each layer of cake, starting on the bottom with red cake, then white, then red, then blue. 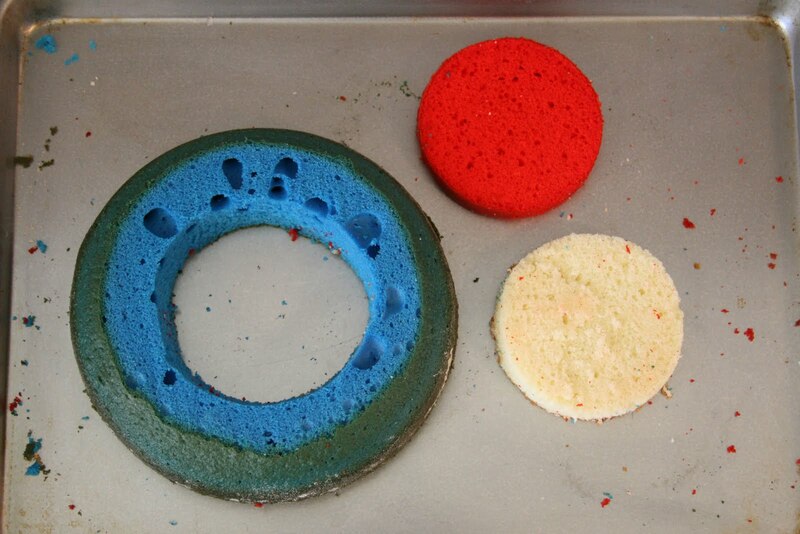 Add some frosting along the inside "ring" of the blue cake to hold in the next two layer which will fit inside the opening. Fill the hole in the blue cake with a 4" round layer of with cake, some frosting, then the 4" round of red. 7. Frost the outside of the cake. (You may want to use a crumb coat first, to keep your frosting white and crumb free). You can read write ups from other bakers who attempted the cake here, here, and here!!! And of course here. Things I learned/would try next time. I would color the frosting between layers to match the stripes. 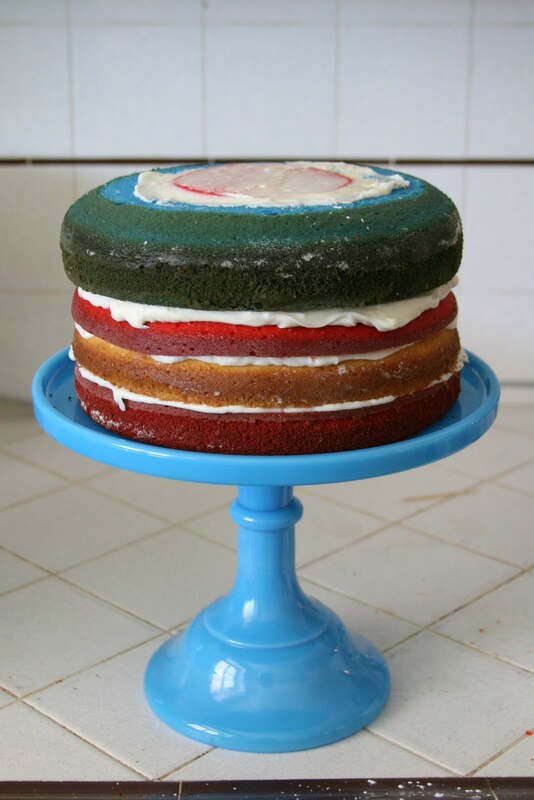 I would use a more sturdy cake, perhaps even red velvet for the red, and then a basic vanilla for others. I would use more icing/thicker icing. Overall, I was very happy with the cake, and it received raved reviews at work..
As I type up this post, I can hear the fireworks from the local park!!!! Happy Birthday America!!!! (Though I just was informed by my history loving boyfriend, that July 2, is actually Independence Day. He forwarded me a great link to share with my readers about myths of the holiday. Independence Day is celebrated two days too late. The Second Continental Congress voted for a Declaration of Independence on July 2, prompting John Adams to write his wife, "I am apt to believe that [July 2, 1776], will be celebrated, by succeeding Generations, as the great anniversary Festival."